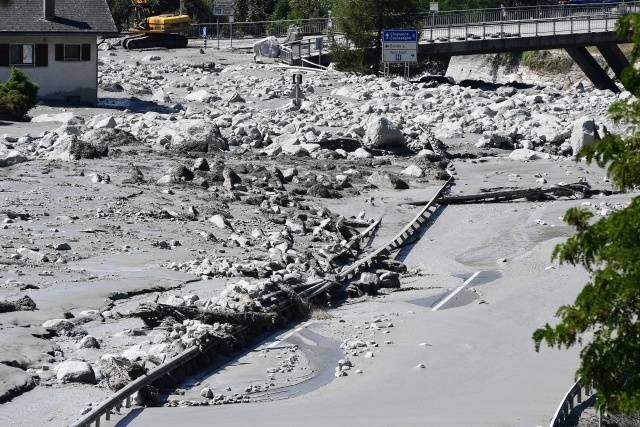 (AFP) - Eight people were still missing Thursday after a massive landslide swept away a mountainside in the Swiss Alps, ripping apart buildings and forcing the evacuation of a village. There had been fears about another six people who had been unaccounted for, but Graubunden police spokeswoman Chiarella Piana later told AFP they had been found safe on the Italian side of the border. Mittner said a massive search-and-rescue operation was scouring a five-square-kilometre- (two-square-mile-) area, involving some 120 emergency workers, helicopters and rescue dogs. The landslide set four million cubic metres (141 million cubic feet) of mud and debris in motion, its relentless moving mass stretching 500 metres (1,640 feet) across, according to the regional natural hazards office (AWN). Simona Rauch, a Protestant minister at a church in Val Bregaglia, a valley that groups several villages including Bondo, told AFP that residents did not expect to be gone so long. That alarm was set off when Wednesday's landslide barrelled down the mountain at 9:30 am (0730 GMT), police said.